Not too often to you get a chance to have such a coin on hand. 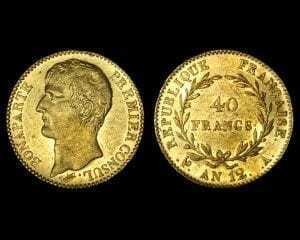 Recently my dad, Randy Briggs Sr., said that it would be fun to build a collection of French Revolutionary Gold pieces. Well someone began that collection today, and they began with this stunning piece. The interesting part about this one is that, unlike most gold pieces that have Napoleon as Emperor, this one has him named as First Consul. I made sure to get a photo before the coin left, and I hope you enjoy it as much as I do.